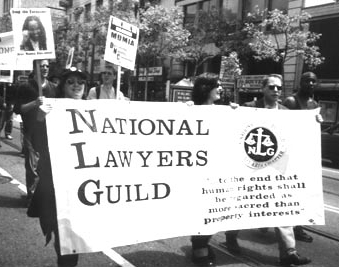 The National Lawyers Guild (NLG), founded in 1937, was the first attorneys organization that welcomed any member regardless of belief or race making it the first integrated bar association. The Guild included a number of African American attorneys but also white New Deal liberals and some lawyers who were members of the Community Party. All of the attorneys regardless of background believed the law should be used to promote social justice. During its early years, the guild attracted nearly 3,000 members and made great strides in creating a reputation as an organization that embraced liberal and in some instances, radical causes. The NLG helped workers organize unions, supported the New Deal programs, and also fought and won racial discrimination cases such as the Hansberry v. Lee, which dealt with a racially restrictive housing covenant issue in Chicago. Despite the Guild’s activity in some high-profile anti-discrimination cases, it argued that economic inequality was a greater threat to social justice than racial inequality. Consequently its appeal to black lawyers began to decline by the end of World War II. By the late 1940s the Guild fell victim to the growing Red Scare sweeping across the nation. When some Guild leaders admitted to Communist Party membership, the organization began to decline. In a span of 13 years between 1946 and 1959, the organization lost almost 2,000 of its 2,500 members because of the anti-Communist crusade. During this time, however, the Guild elected its first black president, Earl B. Dickerson of Chicago. Dickerson presided over an organization that now spent most of its resources defending its remaining members from persecutions and on occasion, prosecutions by the House Un-American Activities Committee and other anti-communist organizations. As its members struggled to keep their names off subversives lists, the organization could no longer provide legal aid for the poor and working class organizations. The Guild experienced a renaissance in the 1960s as the civil rights movement brought to prominence a new generation of lawyers. In 1961 the Guild adopted a resolution which now redirected its primary emphasis toward the fight for racial equality. It established a Committee for Legal Assistance in the South to support civil rights lawyers and also initiated lawsuits, especially in Mississippi, which often brought in the Kennedy Justice Department. In the late 1960s and early 1970s the Guild focused on defending protestors of the Vietnam War. It also formed an alliance with the newly established National Conference of Black Lawyers to continue defending those who struggled to obtain their civil rights.